WILLAMINA, Oregon (AP) — The Grand Ronde tribal flag now hangs In Willamina Elementary School gym alongside state and national flags. After a long and sometimes thorny discussion the school board made the unanimous decision last summer. "I'm proud of our community," said Willamina Elementary School Superintendent Carrie Zimbrick, who has spent her entire administrative and teaching career in the Willamina district. "With discussion and debate, we came to a decision." 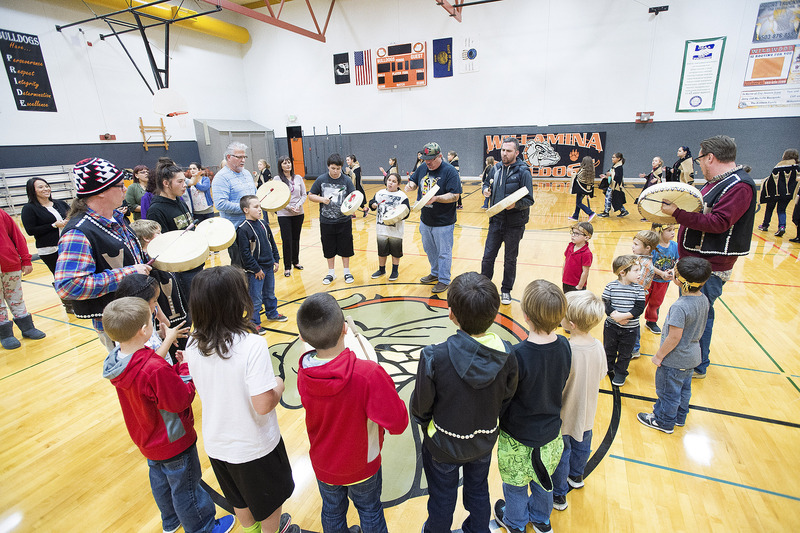 Superintendent Zimbrick sat with a group of first graders as the Confederated Tribes of Grand Ronde staged a flag-posting ceremony in the high school gym. "When the drumming started, they were moving their feet and hands," Zimbrick said. "Maybe they didn't catch all the meaning about what was said, but they enjoyed it." As a result, all three flags -- as well as a POW/MIA flag --now hang on the walls of three gyms on the Oaken Hills Drive campus. And that was the result she sought from the outset. Jon George, Denise Harvey and Tonya Gleason-Shepek represented the Tribal Council at the ceremony, which was attended by students from the entire K-12 district. Angie Fasana, former liaison between the tribe and the school board, and originator of the flag-hanging proposal, also took part. George explained how the tribal flag represents his culture's history, and he emphasized that tribal members represent a long line of ancestors who were present long before anyone else. A graduate of Willamina High, he thanked teachers who helped mold him into becoming a productive member of the Grand Ronde community. He encouraged the students he addressed, many of them tribal members themselves, to be thankful for the instruction they're receiving from their teachers as well. Fasana said the flag represents to her those Native American ancestors who fought and remained on their homeland to help keep their culture alive. Grand Ronde celebrated 32 years of restoration during an event in November on tribal grounds. "When I was born I was not allowed to call myself a citizen of the tribe," Fasana said. "I became a member at 11 years old." Beginning in February 1857, federal troops marched Native Americans from a temporary reservation in Southern Oregon to the Grand Ronde reservation, a distance that covered more than 250 miles and took more than a month. The original 60,000-acre reservation was reduced over the years until the government terminated the Tribe in 1954. All that was left was 7 1/2 acres of land, including a cemetery on Grand Ronde Road. Recognition was restored in November 1983. President Barack Obama proclaimed November as National Native American Heritage Month, and Nov. 27 as Native American Heritage Day. "The messages Jon and Angie presented were phenomenal," Zimbrick said. "Jon expressed thanks to the teachers he had. It could have gone another way for him. Angie was all about reaching out." When Fasana first suggested the flag-hanging to then-superintendent Gus Forster, Zimbrick said, "I thought it was a slam dunk. Ya, absolutely. "I did a lot of research about this issue, across the nation. You're seeing it more and more." She pointed to the University of Oregon, her alma mater, where the nine flags that represent the state's federally recognized tribes are displayed around the Erb Memorial Union Amphitheater. That project began when six students in the Lundquist College of Business were assigned to create a proposal that would enhance culture on campus and leave a lasting legacy. The project was financed through Associate Students of the University of Oregon funds. Students worked closely with the UO Many Nations Longhouse director, while also consulting the Native American Student Union and several key faculty members. Objectives of the project included a show of respect and solidarity to the tribes and Native American students and increasing awareness of the Native American tribes among the campus community as a whole. Information from: Yamhill Valley News-Register: Read more from The Yamhill Valley News Register here.